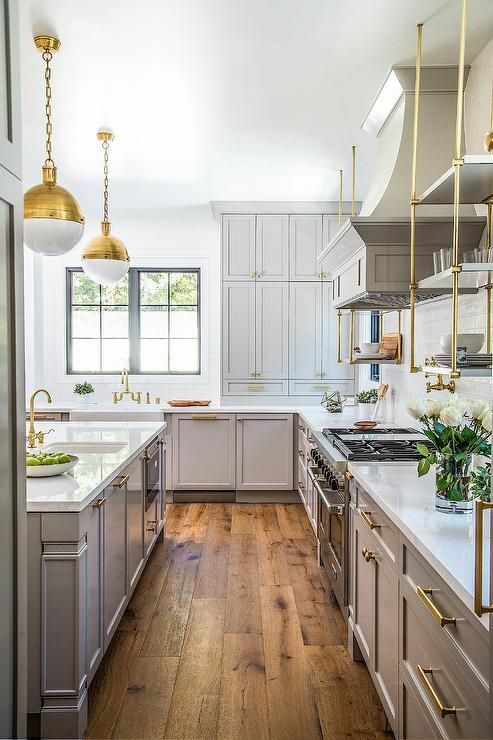 If you've been watching HGTV, flipping through interior design magazines, or touring model homes lately, you've probably seen one of today's hottest trends for home: brass. But is this interior design flashback just a blip or should you start ditching all that chrome, nickel, and stainless? It's true - what was once old is new again, and what started sneaking back into interiors in 2015 has stuck around, becoming more and more prevalent in chic homes and more readily available in a variety of styles and an ever-increasing array of home products. "Our shop is bursting at the seams with brass - and why? We love its cozy warm glow, its easygoing elegance, and its old-school style," said FOOD52. "Brass is timeless in a different way than, say, gold or marble, because it wasn't widely used until the Industrial Revolution. We love that underneath its warm and glinting beauty, brass is a serious workhorse with a serious history. Sure, it looks pretty, but brass has lived many lives, and its industrious past is a part of its charm." Huffington Post likens its renewed popularity to "the chilly minimalism of recent decades fading," and "warm and inviting hues... definitely taking over on every level." Of course, the fact that today's brass is far more stylish than what we associate with, well, the brassy light fixtures of decades ago, has something to do with it. 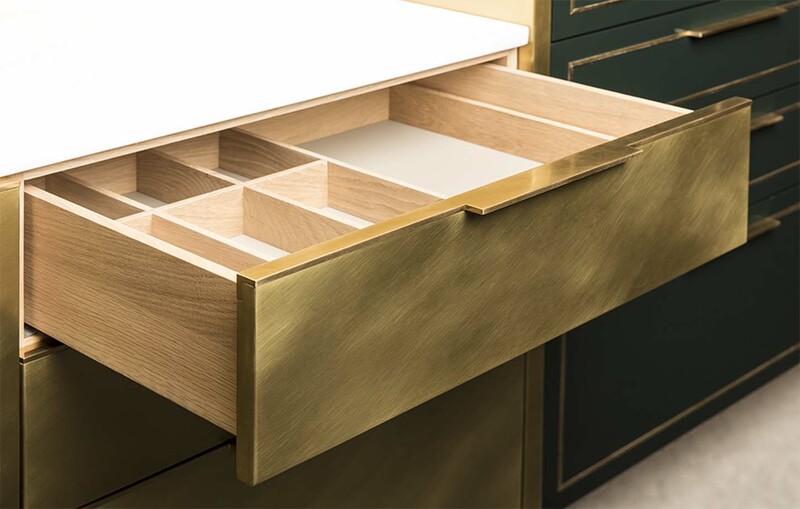 "If you wait long enough, everything comes back in style, and that statement really rings true with brass these days," said StyleBlueprint. "However, this is not the brass of the 1980s, nor is it your grandmother's brass. According to designer Lee Robinson, of Lee W. Robinson Company, brass is much more understated and luxurious than it used to be." We've scoured the Internet for the best examples of brass décor today so you can get inspired to catch the brass ring in your home. 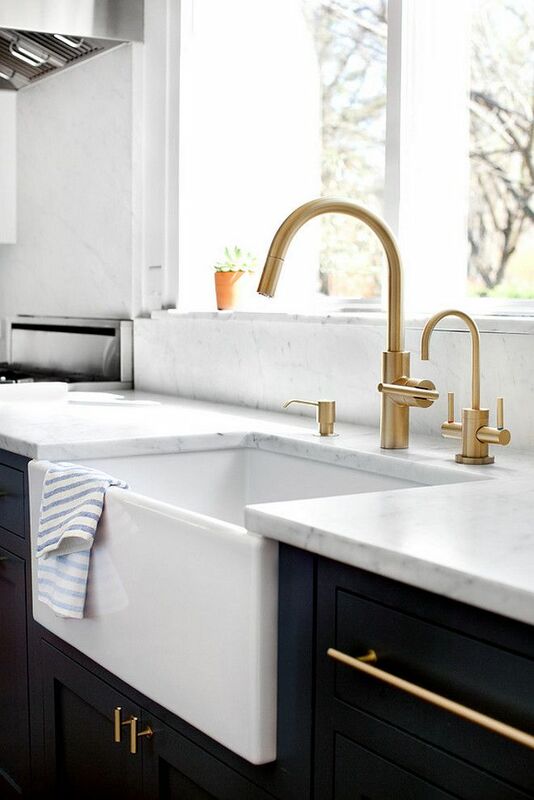 How snazzy do these brass fixtures and hardware look against the black cabinets? Yowza. A touch of brass brings a touch of class. This modern kitchen also shows brass can mix with other metals to create a high-style look. 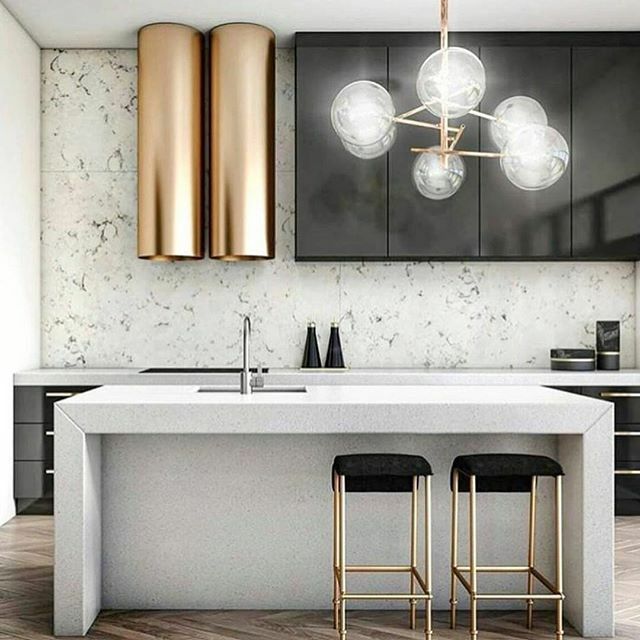 While you probably don't want to go into brass overkill, some attention to accessories, like the pendant lamps over the island and the shelving that flanks the stove, ups the ante, bringing warmth to the space and counteracting the cool gray on the cabinets. ...or in this eclectic gourmet space. 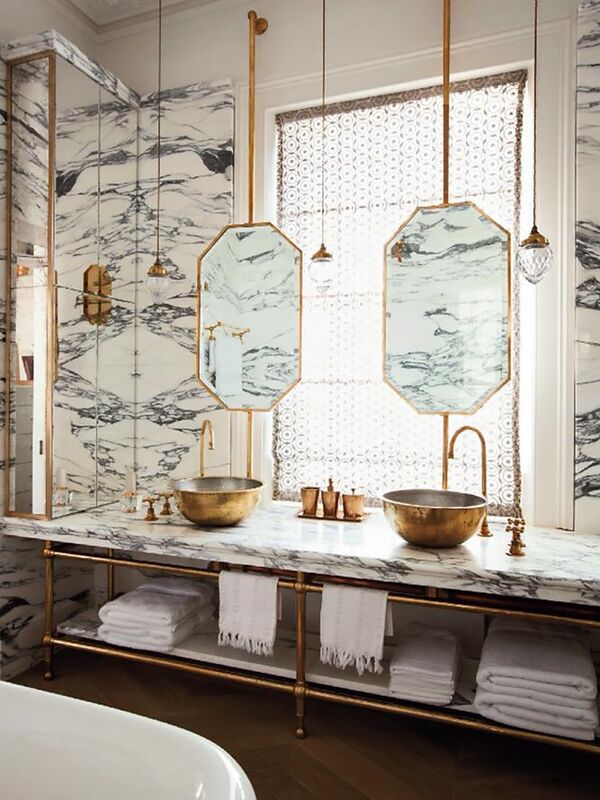 Copper, bronze, and marble make for a stunning trio in this bathroom. Brass shower fittings look amazing over patterned tile. Pulling a similar and complementary hue through to the grout makes this bathroom look even more stunning. With brass, you can take your pick of knobs and pulls. Options are abundant and available in a range of size and styles.